A new 136-kilowatt photovoltaic array is expected to produce 40 percent of the electricity needed at the new Bensonwood/Unity Homes panel manufacturing facility at 25 Production Avenue in Keene, New Hampshire. The solar array components and its installation were provided by local and family-owned Green Energy Options of Keene, New Hampshire. 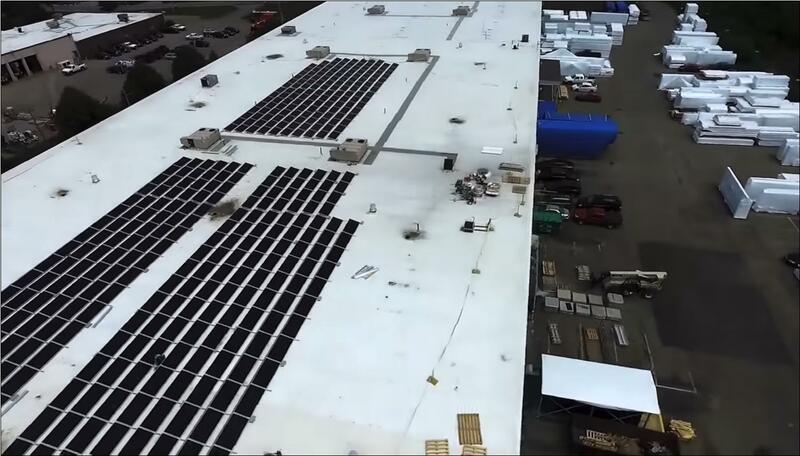 The new 110,000 square-foot fabrication facility, which became operational in April 2018, is now equipped with an expansive rooftop solar array that has a commissioned “turn on” date of June 30, 2018. Bensonwood and Unity Homes join a small, but growing, number of companies using solar energy to power manufacturing facilities, noted Tedd Benson, the companies steward and CEO. Some of the largest operational manufacturing facilities using solar energy to power production in the U.S. include the Volkswagen production plant in Tennessee which uses a 33-acre “solar park” to generate about 13 percent of the energy used by the Volkswagen plant during production. Tesla and Apple have also taken significant steps to use renewable energy to power their plants. “Solar energy is a pragmatic way to power manufacturing facilities,” said Benson. Factories are perfect for harnessing the sun’s rays and creating power because many are built with flat roofs that are ideal for installing photovoltaic panels, said Benson, who added that another benefit is that many factories operate during the day when solar power is collected and generated. Benson said that the photovoltaic array on the Bensonwood/Unity Homes panel manufacturing facility is just another step toward the companies’ commitment to sustainable and clean technology buildings. “We are proud that we can now say we build energy-efficient homes in a facility that is powered by renewable energy,” he said. Bensonwood and its sister company, Unity Homes, celebrated the grand opening of their new panel production facility in Keene, New Hampshire, on April 20, 2018. The production facility produces insulated enclosure systems for high-performance buildings. Bensonwood, in the business of building off-site high-end custom homes and non-residential buildings for the past 45 years, is using the new facility to better serve commercial clients and the multifamily sector, in addition to the single family custom home market. Unity Homes, a six-year-old spinoff of Bensonwood that was founded to bring high-performance homes to a broader market, will use the facility to help achieve its mission of making high-performance, low-energy homes widely available and more affordable. As demand for Unity Homes has grown, the need for increased production capability has become increasingly apparent. Unity will utilize the manufacturing facility to serve more clients in a wider range of markets, including residential developments of high-performance homes. This new facility is part of an expanded vision for the company that includes concurrently launching a brand to serve the industry more broadly and initiating a joint development agreement with a multinational company to develop new technology, said Benson. Bensonwood and Unity plan to offer public tours of the new production facility. Additional information can be found at www.bensonwood.com and www.unityhomes.com. About Tedd Benson: Tedd, founder of Bensonwood (1973) and Unity Homes (2012), has devoted his life to developing a better way to build. A key figure in the revival of timberframing in America, he was one of the founders of the Timber Framers Guild of North America (1984) and authored four books on the subject. Through the decades, Bensonwood established itself as a creative leader in timberframe design, engineering, craftsmanship and CAD‐CAM technology. This work has taken the company to nearly every state in the U.S. (Oklahoma is a holdout), as well as Canada, England and Japan. Today, Bensonwood continues that leadership, pioneering the use of Mass Timber and CLTs in buildings large and small. After having spent many years with the Bensonwood team developing processes, systems, logistics and technology, Tedd went on to found Unity Homes, now a sister company, with the objective to normalize high performance and increase affordability. Tedd is a nationally known speaker and presenter and is the recipient of many awards, including an honorary doctorate from Unity College, and most recently, The Granite State Award in recognition of his statewide and national influence on best building practices.